Billy B. Oliver is a Communications Consultant who recently retired from AT&T Communications after working with AT&T for almost forty years. He was born in Selma, N.C. in 1925. He graduated from Selma High School in 1942, served in the U.S. Navy in World War II, and graduated with honors from North Carolina State College in 1954 with a degree in Electrical Engineering. While at N .C. State he was President of Campus Government, received the "Outstanding Engineering Senior" award, was a member of Golden Chain, Blue Key, Phi Kappa Phi, Thu Beta Pi, Eta Kappa Nu, Thete Thu, and IEEE. He also worked at radio station WRAL to support his family while attending school. During his forty years with AT&T he held various assignments in Engineering, Plant, and Sales, and attended a two year training program at Bell Telephone Laboratories. 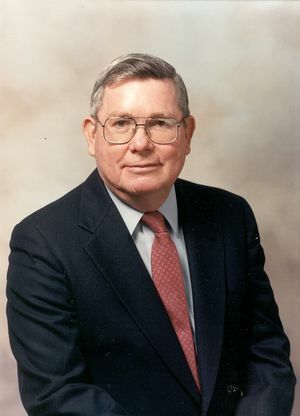 His last two positions were that of Chief Engineer of nine southeastern states from 1967 to 1972, and Vice President Engineering Planning & Design at AT&T Long Lines Headquarters from 1972 until his retirement in 1985. While in his last position, he was accountable for planning, designing, and directing the evolution of AT&T's long distance network. He was responsible for network architectures, technical policies and standards, new technologies and network capabilities, and maintenance and provisioning support systems. It was during this period that AT&T's network was converted to Common Channel Signaling, the switching machines were replaced with 4ESS digital switches, the first fiber optic cables were installed, and the network was being converted to Dynamic Nonhierarchical Routing. While with AT&T Mr. Oliver served on the National Academy of Science panels for the Space Application Board and the Social Security Mechanization Board. He prepared testimony and testified before the Federal Communications Commission, Senator Hollis committee of the U.S. Senate, and before Judge Greene on the AT&T anti-trust case. Mr. Oliver holds three patents. He serves on the Board of Directors of Digital Microwave Corp. and Communications Network Enhancements Inc.
Billy Oliver and his wife Irma reside in New Jersey. The Olivers have two children; a daughter Mrs. Jenny 0. Briney of Virginia and a son David Oliver of New York. Mr. Oliver is a member of the United Methodist Church in Chatham, N J .His hobbies are fishing, swimming, golf, and bridge. Mr. Oliver is co-recipient of the 1989 IEEE Alexander Graham Bell Medal, along with Gerald R. Ash, "For contributions to the conceptions and implementation of Dynamic Nonhierarchical Routing (DNHR) in telecommunications networks." This page was last edited on 14 September 2017, at 14:48.